Ashley Sharpe, an archaeologist at the Smithsonian Tropical Research Institute in Panama, and colleagues combined clues from carbon, nitrogen, oxygen and strontium isotope analysis discovering the earliest evidence that the Maya raised and traded dogs and other animals, probably for ceremonial use. Sharpe found that animal trade and management began in the Preclassic Period some 2,500 years ago and intensified during the Classic Period, making it likely that organized ceremonies involving animal and human sacrifice and raising animals for food played important roles in the development of Maya civilization. Isotopes are atoms that have the same number of protons and electrons but different numbers of neutrons and therefore have different physical properties. For example, carbon has two stable isotopes: carbon 12 with six protons and six neutrons and carbon 13 with six protons and seven neutrons. Carbon in animals’ bodies comes from the plant tissues they consume directly or indirectly. Most plants use the most common type of photosynthesis to turn carbon dioxide into carbohydrates. This process leaves mostly the lighter carbon isotope, carbon 12, behind, bound up in carbohydrate molecules. Corn, sugar cane and other grasses use another type of photosynthesis that concentrates heavier, carbon 13 molecules. Nitrogen isotopes in proteins demonstrate a similar pattern. 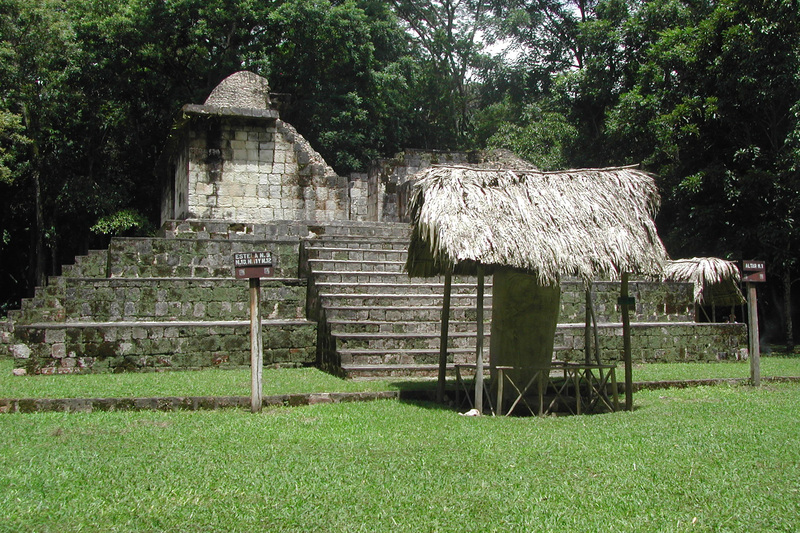 Sharpe and colleagues analyzed the isotopes in animal remains from Ceibal, Guatemala, a Maya site with one of the longest histories of continuous occupation, and one of the earliest ceremonial sites. Most of the bones and teeth they tested were from the Maya Middle Preclassic period (700-350 B.C.). All of the dogs, two northern turkeys, Meleagris gallopavo, the turkey species that was eventually domesticated, and one of two large cats were probably eating corn or other animals that fed on corn, such as a peccary (wild pig). Because people in the region often killed animals that came into gardens and areas where crops were being cultivated, it is possible that peccaries and turkeys may also have been eating crop plants, but it is likely that turkeys were managed by the end of the Classic Period. Deer bones showed butcher marks, but they were hunted from the forest, not domesticated according to isotope analysis of bones that also had lower carbon isotopes. One large cat and a smaller cat, probably a margay, Leopardus wiedii, had lower carbon isotopes indicating that they ate animals that fed on wild plants. The ratio of two strontium isotopes reflects the local geology in a region. Forty-four of the 46 animals had strontium isotope ratios matching Ceibal and the surrounding southern lowlands region. However, to Sharpe’s surprise, jaw bones from two dogs excavated from deep pits at the heart of the ancient ceremonial complex had strontium isotope ratios matching drier, mountainous regions near present-day Guatemala City. “This is the first evidence from the Americas of dogs being moved around the landscape,” Sharpe said. “Around 1000 A.D. there’s evidence that dogs were moved out to islands in the Caribbean, but the Ceibal remains are dated at about 400 B.C.” Part of the jaw bone and teeth of a big cat was found with one of the dogs in the same deposit.